I saw this recipe in a Tamil magazine a couple of months back. I was very hesitant to try it because I was wondering how ridge gourd would taste in a sweet dish. Finally I got the courage and prepared it yesterday. The experiment was a grand success. I did not tell my husband what I was preparing. After it was done I gave him little payasam and asked him how it was. He told, “It tastes like any other payasam. Why do you want to post it in your blog?” He has a very sensitive nose, so he can guess what’s cooking even with the mildest aroma. 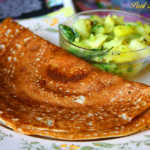 He himself could not believe that it was made with ridge gourd. Wash the ridge gourd under running water and peel the coarse ridges. Discard it and then peel the skin and save it for grinding chutney. Cut the gourd into small pieces. 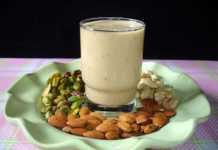 I pressure cooked the gourd, 2 cups of skim milk and 5 cashews for 2 whistles. 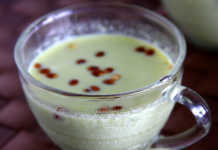 While the ridge gourd is cooking, boil the 4 cups of milk in a heavy bottomed vessel. Wait for the pressure to release and grind the cooked vegetable in a blender. I used an immersion blender and got a very smooth ridge gourd puree. 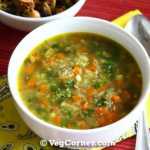 Add this puree to the boiling milk and let it cook for another 10 minutes or until you are not able to smell the vegetable. Keep stirring once in a while so that the bottom of the vessel does not scorch. Add the condensed milk, sugar and cardamom powder and the food color if you wish. Let this mixture simmer for a while. 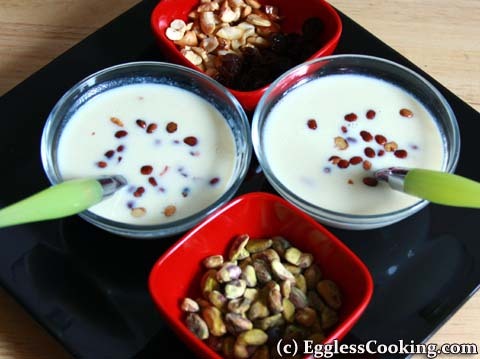 Meanwhile heat the ghee in a small frying pan and fry cashews, raisins and add it to the kheer. The paysam was very delicious. At first I added 1/2 cup of sugar but felt that it was not sweet enough. 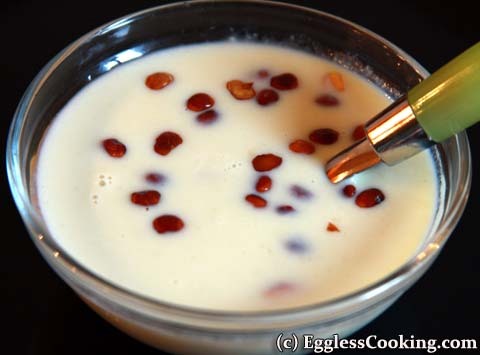 So I added another 1/4 cup, but this made the payasam very swweeeeeeeet. 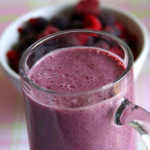 I will reduce the quantity of sugar the next time (more than 1/4 cup but little less than 1/2 cup) . 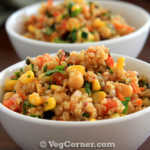 In case you choose to cook the vegetable with water, just remove the cooked vegetables alone and blend it. Reserve the liquid for some soup or stew. If you use milk, you can blend everything together. The author of the original recipe has also given recipes for potato, chayote squash (chow chow), cabbage, cauliflower, green peas, bottle gourd and red pumpkin kheer in the same method. 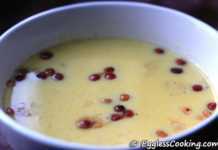 I have prepared the red pumpkin kheer a couple of times and it tastes very good too. I have not yet tried the other vegetables. I also prepare chutney with the ridge gourd peel and chow chow peel always. Yesterday morning I prepared chow chow kootu (daal), so I had reserved those peels too. So I prepared a chutney with the peels of both the vegetables. I know that many of you do it already. Those who are not aware of the recipe, if you are interested I will post it here. Let me know. I was wondering about the seeds inside ridge gourd…We have to clean those right?? Not a whole bunch..just try to get all the seeds and skin.